Heat oil in a pan, add mustard seeds, fenugreek seeds and cumin seeds. Allow it to splutter, add red chilli, small onion, curry leaves, ginger, garlic and green chilli. 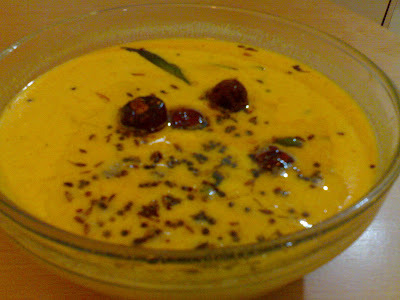 When it turns golden color, reduce the flame and add turmeric powder, red chilli powder and cumin powder. Pour buttermilk and stir continuously, do not allow it to boil. When the steam rises, remove from fire and stir for another 2-3 minutes. Njgalude fav anu Kachi moru. love with rice and pickle.. I too love moru kachiyathu..Its so easy to prepare and tasty too..